MAKAYLA CARDOVA is a 17-year-old girl whose equine dream came true during the spring of 2015 when she and her mother each adopted a wild mustang from a Bureau of Land Management internet adoption. 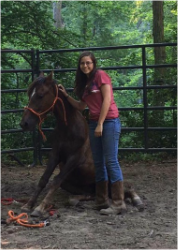 Makayla has been busy training both mustangs since then, and has been selected to be a Youth trainer in the Youth Extreme Mustang Makeover in Virginia this month. 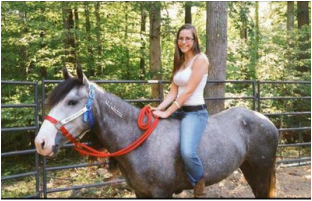 Makayla was featured in our May Issue of Wild Heart Mustangs™ when she told her story "A Dream Come True" . 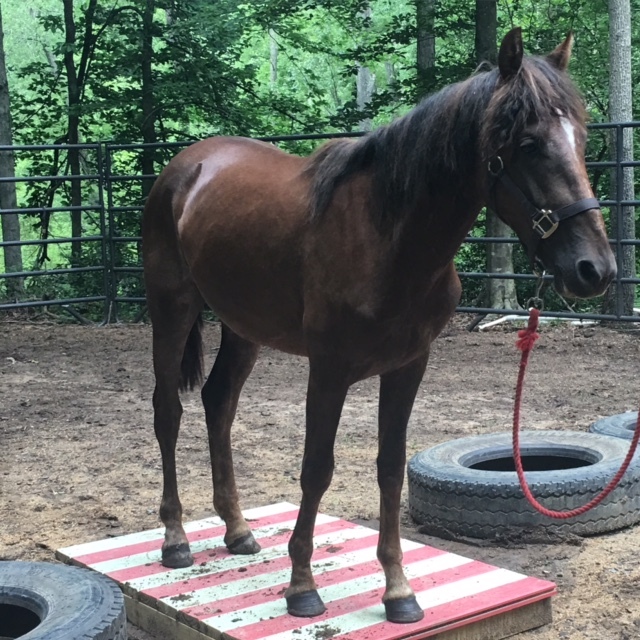 This month she shares her story about "Poppy" her Yearling Extreme Mustang Makeover who will be available for adoption at the end of the Virginia event August 26-27, 2016. Visit our Calendar of Events page for a listing of all Extreme Mustang Makeover Events, and more. On April 30, 2016 we were in Mascot, TN waiting to meet my yearling. We went a day early to look at the horses. 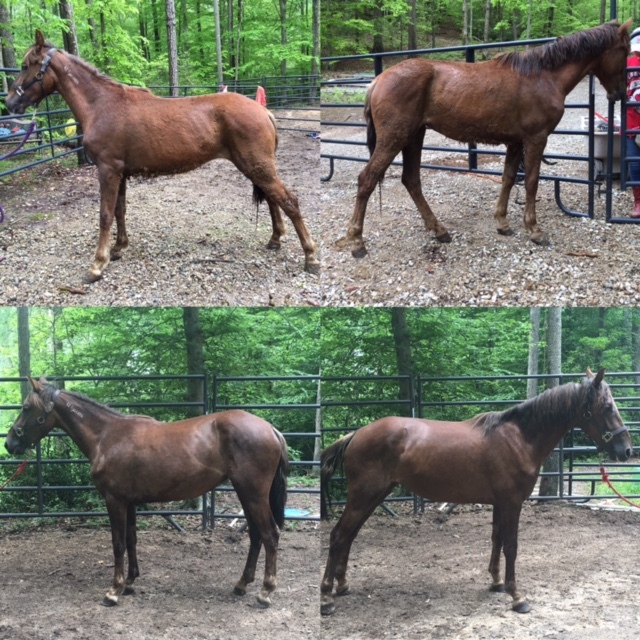 I didn't know what I was getting until I got the paperwork that said 2 year old Sorrel filly. As my mom was filling out the paperwork I was reading my yearling’s paper. She was rounded up February 16, 2015 from Fish Creek, NV. I then looked at markings to see has had absolutely no markings except a star-strip-snip on her face. We went to look at her pen number but all of the Extreme Mustang Makeover (EMM) horses were on the inside of an arena where we couldn't get to them and our view was blocked by the mustangs for adoption. We had to wait until the next morning to see my yearling in person. The next morning we were waiting to see her come down the alley. We still didn't have a name for her and since we hadn't seen her yet we had no ideas. She came down the alley pretty calm. She was only a little spooked because of the other yearling running with her. When I saw her I knew she had a calm eye. She had dead hair all matted up under her stomach. She was shaggy with her winter coat. We loaded up and headed back to MD. On the way home when we would stop I would go look at her from the side of the trailer and try to pet her. She let me touch her nose and then went back to eating her hay. We made it back to MD and went to drop the other 2 Mustangs off who are also being trained for the EMM. The yearlings needed to be separated, as each was going to a different trainer for the EMM. The yearlings didn’t want to be split up, and it took three trainers to separate them. While running in the round pen my yearling came over and stopped in front of me and put her nose out for me to pet her. There were a lot of people there excited to see the horses unload but my yearling, I guess, knew who I was from the long trip back home and came to me for comfort. Finally, the yearlings were divided and we continued on our way home to MD. Once we were home, my yearling unloaded and ran to the panel separating her from Dove and Jackson (our mustangs we adopted last year – read “A Dream Come True” in the May Issue). Dove and Jackson were going crazy that a new horse was here since they are the only horses at my house. That night I was able to pet my yearling. She wasn't spooky, just nervous. It was dark so I didn't do too much with her. Just touched a halter to her face and pet her neck and face. On the way home from Tennessee we picked a name. We decided on the name Poppy, like the flower. I found a quote and thought it fit. 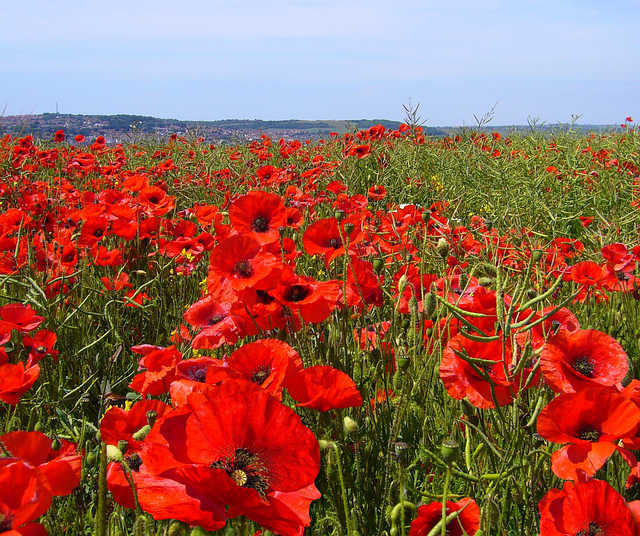 "A flower does not think of competing with the flower next to it, it just blooms". I thought this was perfect for the competition. I'm not looking to win or be number one. I'm training to give her a good start and then find her a great home. The first morning and day of training was May 1, 2016. I had some family and friends come over to see her. It was raining all day long but I was still able to put a halter on Poppy and take her tag off. She was very calm and gentle but she was nervous and unsure of me. Poppy very quickly accepted a halter and she will stand perfectly still while I put her halter on. We slowly started building a relationship. My first goal was to get her brushed and get all of the dead hair off of her. She was definitely not a fan of that and it took about 3 weeks to slowly get everything off. We then worked on lunging and took a walk up to the house in the first 2 weeks. Every day we went a little further until we were walking through the neighborhood. Some people gave strange looks, but we had fun. Each day we worked on something. Today we are able to lunge, halter, pick up feet, tie, stand in cross ties, walk across obstacles, lay down and wear tack. Poppy loves to jump and loves to go on walks. I'm excited for the competition to be able to show what she can do. Top photos - Poppy when Makayla first brought her home from BLM holding facility. Bottom photos - Poppy now, after being in training for approximately 100 days. Wild Heart Mustangs™ wants to wish Makayla, and all the trainers, the best of luck at the Extreme Mustang Makeover in Virginia, Massachusetts and upcoming in September - Texas. Don't forget that these trained mustangs are available for adoption on the last day of each event. Consider making one, your next horse. 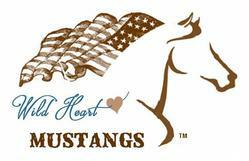 Wild Heart Mustangs™ e-zine will be at the BLM Wild Horse and Burro Adoption in Swanzey, NH August 19-20, 2016. Stop by our table and say "Hello"
On our first visit to the Black Hills Wild Horse Sanctuary in Hot Springs, SD (July Issue) in April 2008 I could hardly wait. 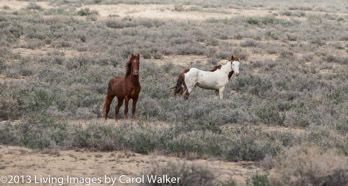 My dream of seeing wild mustangs running free in their natural habitat was about to become a reality. At the time, the sanctuary also had a rather large number of horses available for sale. The monies from the sale of the mustangs, went back into supporting the sanctuary. Most were weanlings and yearlings collected from the range. 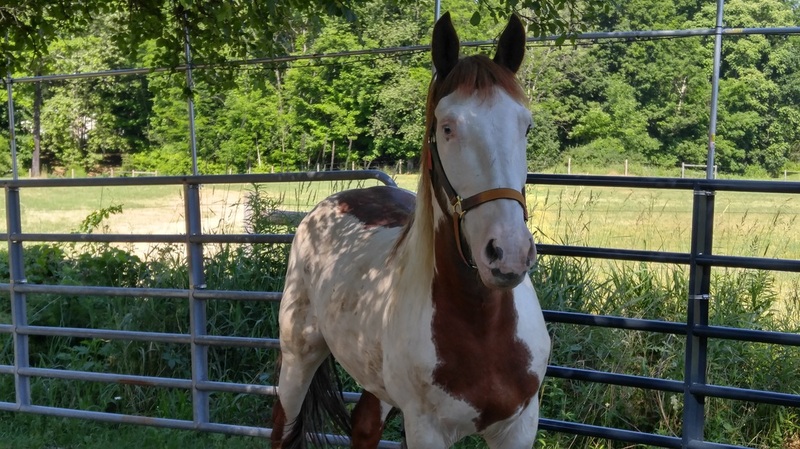 Currently, the sanctuary still has some horses available for sale, but the numbers are much smaller. Careful herd management is practiced by keeping the stallions and the mares separated. 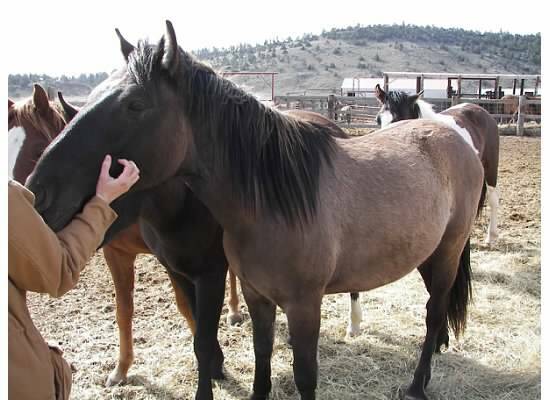 By managing the herd size in this manner, the sanctuary is able to give forever homes to even more mustangs in need. That April, there were lines of corrals of horses. Buck had promised, if I saw one I liked, he would buy it for me for my birthday (coming up the next month). My eldest horse, Max, already retired due to ringbone; Jenny getting up in age. This horse would be not only my first mustang (something I never could have imagined), but also my new riding partner for a good part of my life. It was like Christmas to me. ​First I went to look at the yearlings. When I walked into the paddock, not one of them seemed to have an interest in me. Most never bothered to look up from grazing on their hay pile. They didn’t seem to have a care about me as long as I kept my distance. But….wait….there was one that had an interest in me. She spotted me from across the way and slowly approached. She definitely had the intention of heading directly over to me. I stood still, not wanting to spook her. How close would she come? What would she do? Closer and closer, until we were breathing the same air from each other’s nostrils. My moment was disturbed by a strong voice yelling from outside the paddock, “Don’t fall in love with the first one you see!” Yup, Bucky. It was too late; this little filly had chosen me. This is my Neeheewanna. Neeheewanna is a very special girl for a lot of reasons. Besides the fact that she chose me, we were told that her mother, Mrs. B, was a wild mustang at the sanctuary. One day Mrs. B disappeared. She jumped the fence and hadn’t been seen for years. It was presumed she was dead. But one day, Dayton Hyde saw a horse along the edges of the sanctuary. She looked remarkably like Mrs. B. By her side she had a yearling and a weanling. Dayton opened the gate, she brought her babies back into the sanctuary and died a few days later. It was like she was bringing her babies home to a place she knew they would be safe and cared for. Neeheewanna was that weanling. Neeheewanna is special also because she is our mustang that has been the most challenging to train. ​We attempted, unsuccessfully, to train Neehee under saddle ourselves. We did a lot of right things, but we also knew when it was time to get a professional involved. We ended up calling Dave Minteer, Jack Minteer’s (Rose Hill Ranch) father. Dave was doing limited training and semi-retired. Jack and Emma had not gotten their place yet. The Minteer’s came highly recommended from people we knew. We sent Neehee for 60 days of training. At the time, that is all we could afford. Every horse is different. Like people, they all learn at different paces. Neehee came home after the 60 days. She could be ridden, but only by someone with experience. Neehee liked to buck. Before we brought Neehee home, Dave had Buck ride her and taught him what she had learned so we could continue to do the same thing at home. ﻿Wakan still training children who are new to riding. This time he is teaching Kamryn, our 9 year old granddaughter how to ride. 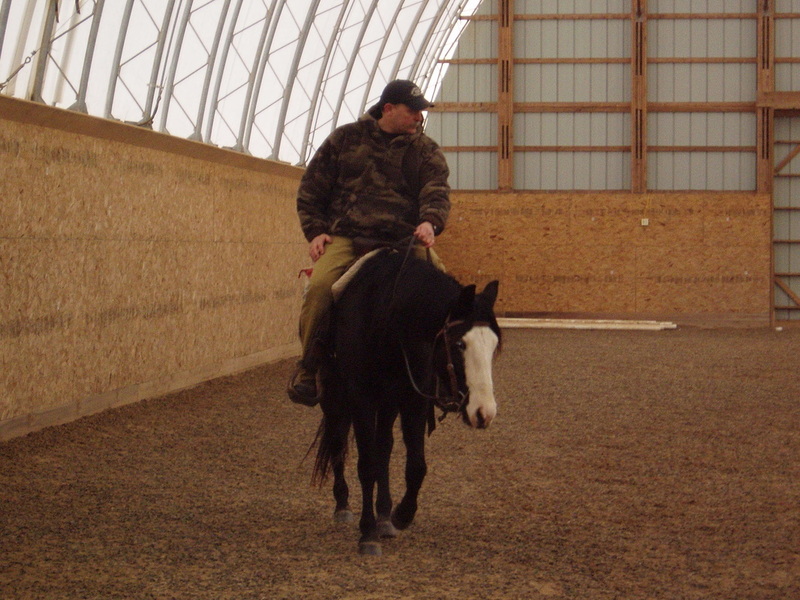 Buck riding Neehee before we brought her home from training with Dave Minteer. That was the plan anyway… but life got crazy. Unimaginably crazy in every sense of the word. Read “Timing is Everything” (July Issue to find out more). So the horses had a couple years off before we finally could financially afford, and had the time, to work with them and send them back for training. This time we sent both Neeheewanna and Wakan. We took them to Jack and Emma Minteer, as they now had their own barn (Rose Hill Ranch) and were taking clients, and Dave was essentially retired. I was hoping that we could start fresh with Neehee and have her in training long enough this time to correct her bucking issue. I am not an aggressive or a strong rider. 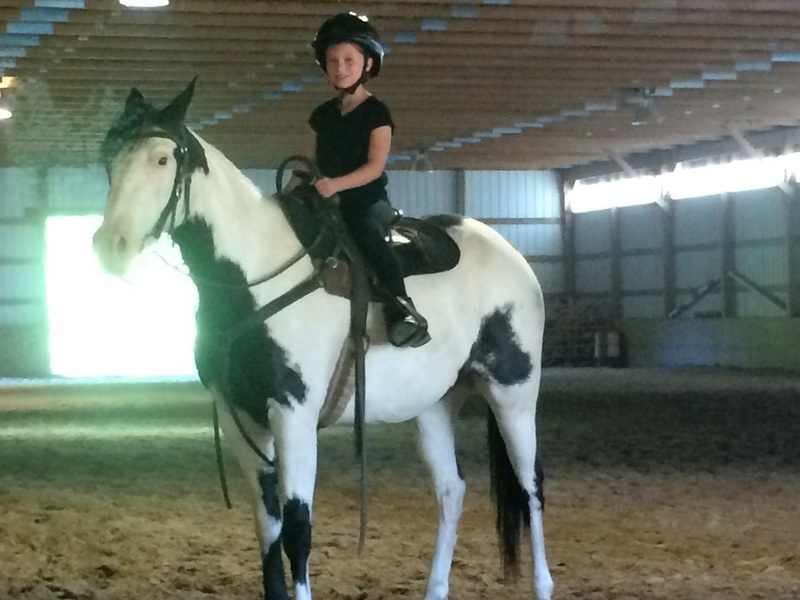 We told Jack and Emma we wanted both horses to stay until they were safe enough for anyone to ride…even a child. Wakan was a super star! Laid back, kind of on the lazy side. By the time we brought him home (after only a couple months) he was giving lessons to children who had never been on a horse before. Neehee was still having issues with being unpredictable with bucking. It was not her back, her saddle, or any other physical or equipment issue. I found out that a woman who had her half sibling had the same issues. We brought Wakan home and I began to ride him. Neehee stayed a bit longer. I was not going to give up on this horse. I absolutely refused to give up on this horse. I WAS going to ride her safely one day. I held on to that. We put our heads together with Jack and Emma to try different training techniques until we hit on something that was successful. When she finally came home, I would have Bucky ride her before me. We would lunge her, he would ride her, then I would get on. She was doing a lot better. You guessed it…then we got busy and they sat again. Neehee's training has come full circle. 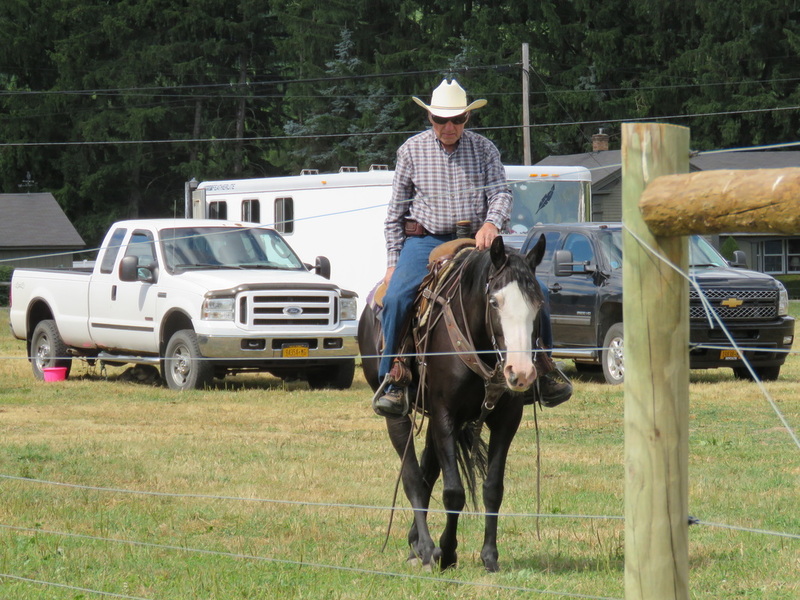 Above photo shows Dave Minteer having an impromptu ride on her last month before a show around the show grounds in Campbell, NY. No worries about her bucking him off now. ​This spring we sent Neehee, Wakan, and Clover for a tune up. We sent Sweet Potato to learn ground work (April Issue). We brought Wakan, Clover and Sweet Potato home. We left Neehee longer, but this time for a different reason. She seems to have a gift for reining and cow work. Both, of which, I know nothing about. Because she has a talent for this, we decided to continue her training in it. Why? For several reasons. 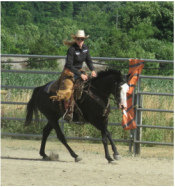 First, there are many aspects of reining that will carry over into other types of riding I am interested in doing. Second, it is a good education for her. She has been going to shows this summer with Emma showing her. She is learning to trailer with different horses, go to new places, be around a lot of stimuli she is not accustomed to. She is learning patience, and working in new environments. Now I have a horse that is smarter than me…but that leads me to my third bonus of her learning. I am now taking lessons on her so that I can become a better rider, communicate better with my horse and we can grow together. Kamryn (aka Pocketknife our 9 year old granddaughter) is taking lessons on Wakan, so we have grandmother / granddaughter time together in the saddle. Buck goes with us, we make an evening out of it. It has become a family activity that we all look forward to every week. Mary Lainhart taking lessons on Neeheewanna with Kamryn taking lessons on Wakan Lakota this summer. Emma Minteer, Rose Hill Ranch, showing Neeheewanna in Reining and Cow Work this summer. I never used to care about showing any of my horses. I just wanted to jump on and have fun on the trail. Now, I realize, that even if you don’t intend to “do shows”, doing a couple is a great experience for your horse that you don’t get on the trail or during a regular lesson. It works the other way around too. If you only do shows, taking your horse out on the trail will teach them an invaluable set of skills they will never get in the arena. Wildlife, natural obstacles: trees, water, boulders, vines, etc. You never know what you will encounter on a trailride. 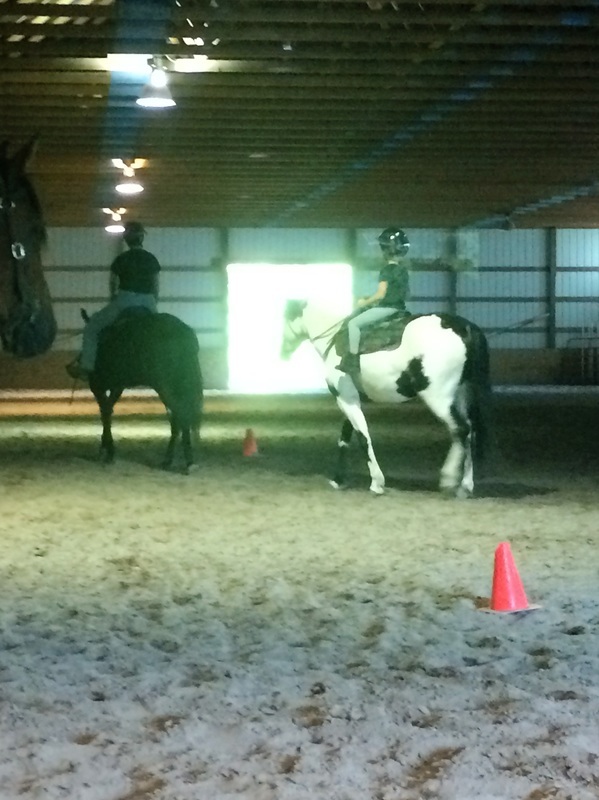 Every time you take your horse on one, they are learning something new. If you predominately show, I think it also gives them a nice change of pace and gets them thinking about a lot of different things. I always encourage our grand kids to try new things, just once. If they don’t like it, at least they tried and they know they don’t like it. But if you don’t try new things, you will never know what else is out there for you to experience. I guess, in that respect, I am taking my own advice and also giving some of it to my horse. These photos were taken by Carol Walker of Living Images in 2013. 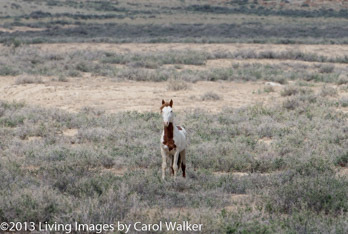 This horse, at that time in the wild, was collected off the range by the Bureau of Land Management (BLM) and adopted via a BLM Internet Adoption by Joan Hoge. Now known as Red Cloud, at his new home with Joan Hoge. Joan, Thanks for sharing your beautiful photos of Red Cloud! 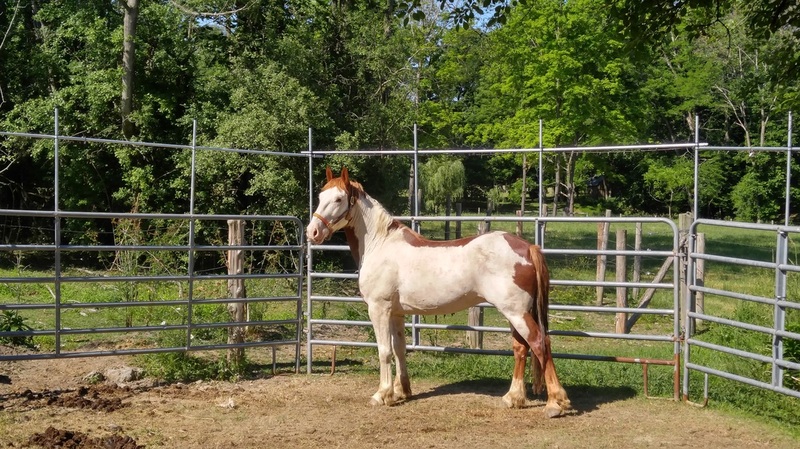 If you know anyone who would like to share a photo of their Mustang, Burro, Mule or Donkey - have them send it to mlainhart@wildheartmustangs.com We would love to have them.